It’s often said that simplicity in cooking is a virtue, that ingredients should be allowed to speak for themselves. This recipe has just four ingredients, and at a push, you could drop one of those, but they’re carefully combined into something quite exceptional, something that won’t hang around for very long once it’s cooled. The trick to these sesame and peanut slices is to toast the nuts and seeds just right. This isn’t easy, especially when you’re handling a kilo and a half of ingredients, but it’s only that sort of volume that will let you produce nearly thirty slices and – believe me – you want that many slices. Peanuts and sesame seeds need to be handled differently, but the same careful approach is needed. If you burn either, you’ll end up with a bitter, smoky taste that will defeat the whole recipe. The peanuts, a kilo of them, skinned, plain (not salted) go in the oven, in a single layer spread across a couple of baking sheets. Fifteen minutes at 160c should do the trick, as long as you take them out once or twice and shake them around so that they roast evenly on all sides. The peanuts should be a richer, more golden colour, but they mustn’t burn or catch at all. If they do, start again. The sesame seeds, 500g, are best toasted in an enormous frying pan, set over a steady medium heat. Keep the seeds moving all the time, never letting them rest on the pan for more than a second or two. They’ll turn golden brown in an instant, so be sure that you catch that instant exactly and don’t go past it. When everything is properly toasted, tip the nuts and seeds into a large bowl. To make this quite tasty bowl of richly toasted seeds and nuts into something more like a biscuit, you need something to bind it all together. Pour 500g of honey into a pan and add two tablespoons of sifted icing sugar. It’s important to sift the icing sugar into the pan, to avoid any lumps, as stirring out the lumps from unsifted icing sugar is a stupid waste of your time. I made that mistake so you don’t have to. Gently heat the pan and stir the contents until the icing sugar is completely dissolved, then turn the heat up and bring it to the boil. Don’t stir, just boil until the temperature reaches 116c, or the so-called ‘soft ball’ stage. You can identify the soft-ball stage by taking a small amount of the sugars and dropping them into a glass of cold waters. If they form a soft ball that’s still pliable, you’re there. It’s far, far easier to use a sugar thermometer, though. You can get hold of a cheap one for a few quid and it’s worth the investment if you want recipes like this to work out properly. When the honey mixture reaches temperature, work very quickly and pour it straight into the bowl with the nuts and seeds, stirring to coat. Tip the mixture out into a well-oiled, medium-sized baking tray that’s at least forty or fifty centimetres by thirty and two and a half centimetres deep, and spread it out evenly, pressing down with the back of a spoon. The honey mixture will start to set straight away, but it’ll take a few hours to fully harden. The mixture should set hard, but it’ll still have some flex to it, so be careful when liberating it from the pan. The best way to do this is to run a dinner knife around the edges and then tip the tray upside down. Gravity and the odd prod and poke with the knife should do the job. Slice into two or three centimetre squares and serve. They look delicious you can never go wrong letting the ingredients shine through without all the extra filler. Oooh! These sound lovely! I’m all about simple recipes that yield delicious results 🙂 Buzzed! I am a big fan of peanut brittle and this has really caught my eye. 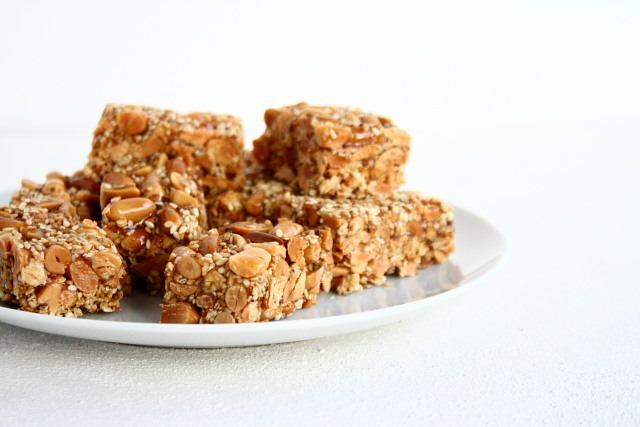 The combination of sesame seeds and peanuts is fantastic! Thanks for sharing. This does look good. I’m looking forward to trying it. This recipe sounds amazing, I’ll have to try it! Also love the way you write. How come I’ve never come across this blog before? My browser must be crazy. Anyway, consider me a reader from today. This certainly sounds very addictive. Love peanuts, more so with sesame seeds. That looks incredible! We love sesame seeds, and things like sesame snaps so this looks awesome to me! Very cool…and quite healthy too with all those seeds! Perfect for hiking and such. hello! just stumbled across your page and I see that you live in saltaire, i live in leeds and it’s great having a foodie blogger right round the corner! great site!